These cute pastel colored sweets are more to watch than for eating. I think they would even survive from nuclear explosion they so full of E-codes (you know what I mean), they taste like plastic. Lovely pastel photo and brilliant comment! You are so funny, Henrietta! I guess pretty food doesn't always mean it tastes good. Lovely soft image -- well done dear! They do look tasty! I love the soft, pastel look of many of your photos. They look so adorable though! 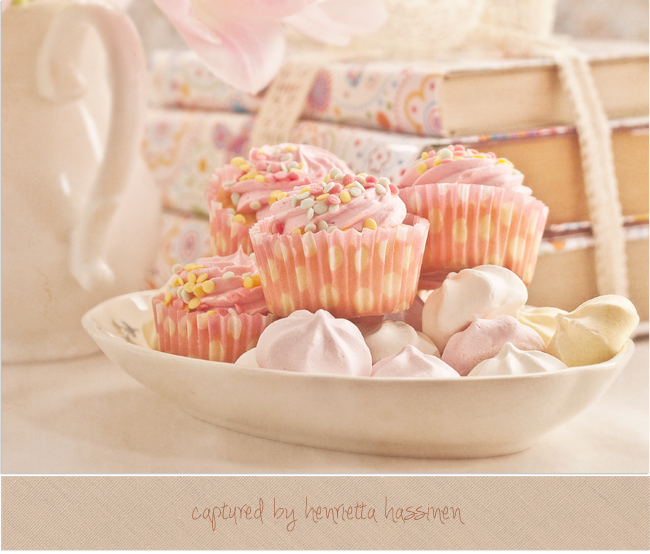 Love the soft, sweetness of your photo. It is a special occasion? Love the hues and delicate details. Ser underbart gott ut, fantastiska färger. Your explanation made me smile as I have made some cupcakes that are better to look at than eat. Love the colors, so striking. So beautiful! I love visiting your blog. Your art always feels so fresh and alive. Lovely picture - I love how you process you pictures. They are so soft and delicate looking. This is simply perfect Henrietta! I love the composition and the beautiful soft color. Beautiful shot! They look delicious. A few people have said - magazine quality - I agree! Every shot you take is simply beautiful! This photo takes me right into a lovely tea party! Oi mikä ihana herkkukuva! Kuppikakkuja on tullut tehtyä monesti tätänykyä (vyötärö kiittää?!). Ne valmistuvat niin nopsasti, kun haluaa jotain hyvää kahvin kanssa. They do make for a lovely picture. I like the stack of books behind them as well.